Home › For Pastor's › Worship: Thermostat or Thermometer? I have the good fortune of being the proud son of an HVAC engineer. Though I am not in a field of engineering, nor do I have the skills necessary to be an engineer, I did learn (at a young age, mind you) some very crucial lessons in my house. I should start with a few background notes. First, I am by nature a very curious person. Second, I learn by “touching” not by “looking”. Incidentally, most of the time growing up, those close to me ended up learning that when I wanted to “look” at something, it meant I wanted to explore it by touching and manipulating it. It didn’t take them long to catch on to my game and figure out that they better be careful how they answer me. 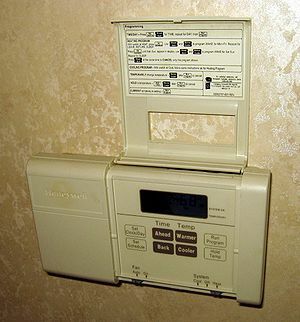 One of the things that I was most fascinated by in my house was the digital thermostat. It met all the criteria of something that would interest me: it had a display, it was electronic, it had buttons on it, and when you manipulated it, it controlled and operated things. To my young mind this was just too good to be true. Hence, my valuable childhood lesson was this: don’t “look” at the thermostat without permission. Being an adult now, I know that touching the termostat can have broad reaching consequences. It can cause the energy bill to go down, or up. It can cause the temperature in the house to get cooler or hotter. It can engage machinery and fans, compressors and air handlers, refrigerant and condensation. In addition to revealing the temperature in my house, it also can set the temperature in my house. What about a thermometer? A thermometer can do nothing of the aforementioned things. It can simply report data. Here is the analogy. Throughout the Old Testament narrative, the former prophets show us that the cultic activity of Israel, borne and fleshed out in its worship practices, gave the onlooker a very keen insight in to the spiritual health of the nation. This is a significant point, because it tells us something that worship did not do. Worship did not create the revival, nor did worship contribute to the degeneration. It was reflective. It simply demonstrated what was happening during the other 165 hours of the week that was brought in to the tabernacle. It is a fact that people (especially pastors) get run down and beat up. It seems like every other day is Sunday. Standing in front of God’s people and feeling the need to be “fresh” (in terms of preaching) can seem like a daunting, if not impossible, task to undertake. Men who have been in the ministry long term tend to forget that “freshness” and “vitality” comes from a vibrant worshiping life before the face of God that comes out of the 165 hours of the week; it cannot simply be manufactured or “put on” in the pulpit. The same goes for the congregation who is seeking vitality. It is a farce to think that the corporate gathering of God’s people will somehow engender enough vibrancy in the communities dwelling with God that the corporate worship experience will be able to carry them through from Sunday to Saturday. It is an unhealthy expectation to put on the church, her leadership, and her people. Vitality with God is developed and nurtured in the home, in the heart, and in the fellowship with other believers as lives transformed lead transformed lives. Sunday is a thermometer of the church, not its thermostat. a good word that i needed this morning. thanks! This is very good David. I like where you’re going with this. Here’s something I’m trying to work out for myself, and am planning to do some study on this summer: One of the reasons we’re so confused about the role of corporate worship is that we have no theology of rhythm. Without acknowledging that there’s a pattern to the week of (work*6 + rest) (or now- [rest + work*6]), we are unable to put corporate worship in its rightful place AND the worship of everyday life in its rightful place. Your thermometer metaphor helps me a lot in thinking about this. I look forward to talking more about all of this. It is interesting that the issue of a sabbatical rhythm would be running through your mind; it has often been through my mind as I have been writing these things. Would love to connect via phone or FB and think through these things some more. Hope you are well!